In 2011, my husband lost one of his cousins in a tragic accident over Memorial Day weekend. The holiday now has new meaning in his family. 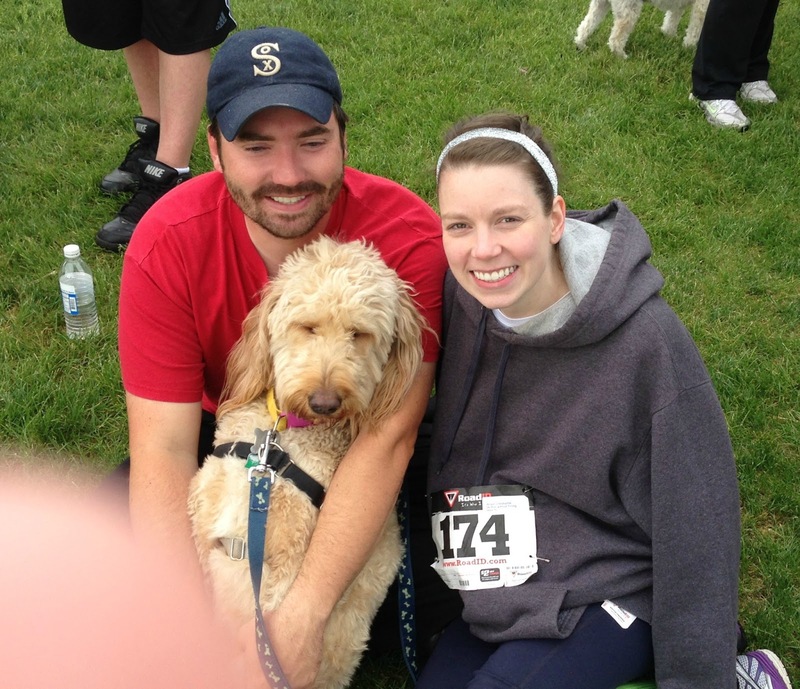 Last year I organized a memorial walk/run at a 5k near my husband's family cottage. The entire family participated in memory of David. I thought things worked out well last year and I was asked to organize the event again. The thing I love about the Two Rivers Meet event is that they offer menu pricing. There is a general cost of the event, and then you pay an additional cost for chip timing and a shirt. If you don't want one or the other, you don't have to pay for it. This event also has 4 different distances: 5k run, 5k walk, 10k run, 15k run. (The local running clubs are out in full force in the 15k.) For a small town race, this really is a fantastic event. We arrived at the start (where there was plenty of parking) about 30 minutes before the start of the race. I was able to pick up our bibs and drop off the swag in my car with plenty of time to spare. The 10k and 15k runners had an earlier start time to help avoid overcrowding on the course. I lined up with some other of my husband's family members for the 5k run, but definitely near the back. My plan was to run a half mile, walk a half mile, etc. until the finish. Pepper was going to keep me company, but to my surprise, the hubs came up to me at the start of the race and hung with me. 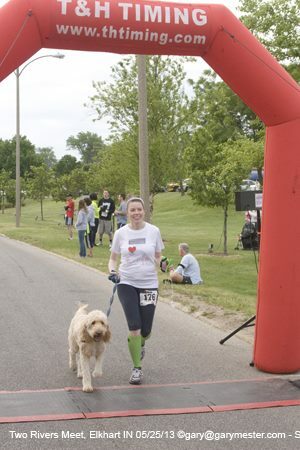 He hates running so I thought it was sweet that he stuck it out with me. Pepper couldn't have been happier and made new friends out on the course (always). She really is the life of the party. After about 2 miles of the race, when I was ready to start my next half mile of running, I just couldn't do it. I had to go to the bathroom extremely bad, I was no longer having any fun, and I was just over it. I knew this would be my last run of the pregnancy and how I felt at the race really solidified my decision. After a quick pit stop at the restrooms at the park the course went through, I was beyond over it. After I was done, I was ready to smile and have some fun for the weekend. The race had a great amount of post-race snacks and bottles of water to take away. We didn't stick around for awards for obvious reasons, but we did stick around to get some nice photos of the group. Flags adorn the town square in memory of fallen soldiers for Memorial Day. It really is a beautiful scene and a nice reminder. I really love this race and we will probably do it again next year. If you are in the Michigan/Indiana area over your holiday weekend, I highly recommend it. Oh my gosh! Is someone holding Pepper up in that pic? LOL! What a great event! It's awesome that you got to make it your last running event! Haha, the hubs is holding up Pepper instead of jumping. What a wonderful tribute to your husbands cousin. Pepper looks sooooo happy in those photos. CB is totes jelly he has not participated in an organized event... Yet. I love seeing Pepper in the photos! Making sure you know who is the star of the photo! lol Good job finishing and understanding your body! If I don't do Soldier Field next year (I think they were on the same day, right? ), I'd do this one! I love a small race, I'll probably be in the area, and I think that's a really neat way for the family to all honor David. Thanks! I imagine in the city it is harder to find dog-friendly events because many races are pretty crowded. The suburbs are probably your best bet! Haha, yes, Pepper LOVES any and all attention. Thanks! Awesome pics, and you look great by the way! Way to go! Thanks! She is my best pal! Haha, yes. He was camera shy so had some fun with Pepper instead.